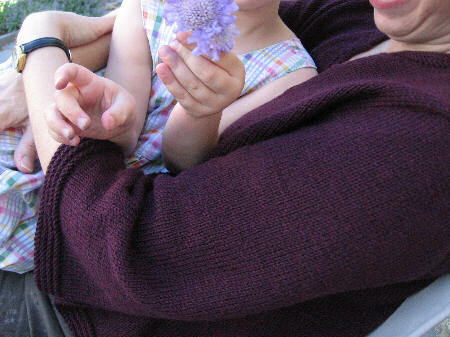 A Bluestocking Knits: "Pearl Buck Swing Jacket Knitalong"
Welcome to new members of the knitalong, Sarah of Lieblingsgarn, and Little Jenny Wren! Beth writes, "I've started on the back, seems to be going smoothly so far - I just find Kate's design with that back pleat to be ingenious. However, I think I need to make mine a little longer than the pattern calls for - and feel rather intimidated to figure out how without goofing up that pretty pleat as well as matching up the front pieces!" I think that lengthening the body would involve a bit more than just working it longer than instructed, because of the back pleat. I've never modified such a tailored garment before, so if anyone has some advice, please shout out! My guess would be that in order to keep the armhole shaping intact, the length needs to be added to the body pieces below the point where the armhole shaping begins. On the front pieces, this isn't much of a problem, as you can either add some rows in at the "continue even in patt until piece measures ___" part, or add two rows in between the decreases (as I did for the sleeves), to keep the line of the side seam straight. For the back, you might be able to add a bit of length by widening the yoke piece, and then repositioning the armhole shaping on the back, but you either have to know ahead of time that you will adjust the length, or be prepared to reknit the yoke. This would be considerably fiddly, as well as setting the top of the pleat further down on your back, rather awkwardly. The diamond section on the pleat is the same on all sizes (112 rows), and so obviously the least-complicated way is how Kate set the stitch count for the differing sizes, by adding stitches to the plain sections on either side of the pleat, and then at the "cont without further side decs" section (just before the armhole shaping begins), do decrease until the correct number of stitches for your size is reached. The pattern doesn't give you much space to perform this trick, but I think it could be done, as long as you don't want a lot of extra length! It might be simpler to put the side decrease rows closer together, spacing them out evenly through the stockinette section. Kate Gilbert is, of course, the designer of the Pearl Buck Swing Jacket, currently being fêted here in this knitalong. She recently took some time from her busy schedule -- motherhood, magazine deadlines, unpacking! -- to chat with us. What was your first sweater design like? 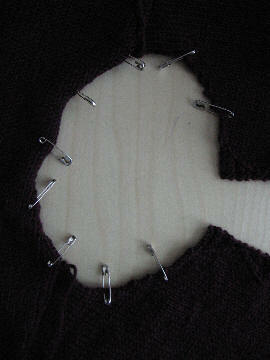 My very first sweater design was a complete and utter failure. I never put it all together but I still have it. 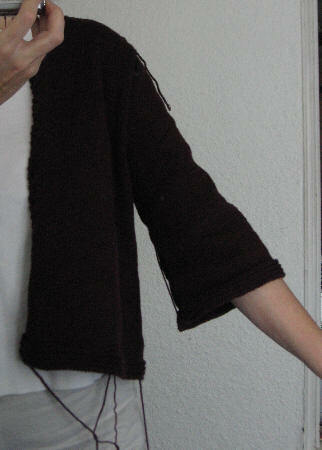 The body is basically a giant poncho and the sleeves are these stubby little things. You can see it here: http://www.kategilbert.com/blog/archives/2006/03/public_knitting.html I had no idea what I was doing and had only made a (very ugly) scarf before. Definitely. I have to learn to let go of a pattern at a certain point because there are deadlines and it’s just not realistic to do things a thousand times. I would get tired of them and never finish them. Thankfully I learn something with each pattern I write and hopefully each one is a slight improvement on the last. Also, I’ve had to learn to let go of my patterns after their published. I’m always happy to see what people do with them. I like when knitters run with them and make them better. Sometimes, they choose a yarn or color or button that I would never have chosen, but I hope that’s what will make it “perfect” for them. What is most important to you as a designer -- fabric, shape, texture? Is D) all of the above a possible answer? I think shape is really my main obsession. My first inspiration for a project usually comes from a certain silhouette that I’m trying to achieve. In the case of the Pearl Buck Jacket, the shape I was going for would have required a fabric that is probably nearly impossible to achieve with knitting but I decided to give it a shot anyway. Then, the yarn that was chosen for the project changed the shape, fabric and texture that was possible. It’s all a compromise. Sometimes it’s a technique that I would like to try or use again. Sometimes when I see people from a distance, I think they are wearing something great and stalk them down to get a closer look. It usually turns out that they aren’t wearing at all what I thought they were so I try to create what I had imagined they were wearing. I guess I’m most inspired by a challenge though. I try to figure out if it’s possible to knit a certain shape, or rather, if I can figure out how to do it, since I imagine anything is possible and there are certainly people out there much cleverer than myself – those knitting mathematician people could probably knit anything. What do you enjoy most about your work? least? I love that feeling you get at the end of a project, you know, the one where you say, “I made that!” and you want to show it to everyone. Believe it or not, I also like the deadlines. I would probably never finish anything without them. I’m good at working under pressure and with restrictions. I practically never finish any of my non-work projects. If I can be honest, the thing I like the least is having to go back and reexamine a project when it’s done. By the time knitters are out there knitting up a pattern, usually at least 6 months have passed since I knit it and thought about it. I’ve usually finished a couple projects since then and am neck deep in something new. I find it really hard to go back and remember why and how I did something in order to answer questions that people email me. They often have a better idea of what’s going on in the pattern than I do. Is there a usual starting point for your designs? Do you plant it all out first or improvise on the needles? All of my projects start with a sketch or at least a vision of what I’d like to make. I’ve tried just sitting down and knitting something, but I’m not really that sort of person. 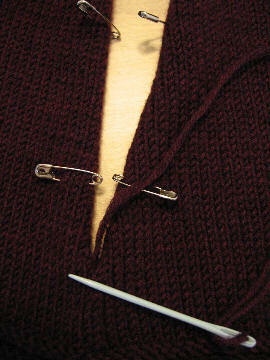 I need to plan it down to the last stitch and then revise it on the needles. I’ve tried several times to make things that were randomly striped. I can’t do it. I always end up sitting in front of my computer planning my stripes so they appear random. 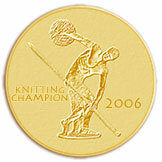 What knitters have influenced you? Kaffe Fassett was my first big influence. I taught myself to knit when I was in high school using books that I had found in the library. Most were full of patterns that I wouldn’t have touched, especially as a 16 year old! It was only when my art teacher lent me his wife’s copy of “Family Album” that I realized there were all sorts of possibilities for using color and patterns in knitting and that yarn didn’t have to come from Walmart. More recently, Elizabeth Zimmermann never fails to inspire me. If you were to have a motto in life, what would it be? Try everything once – except organ meats. Kate blogs at Needles on Fire, and more of her patterns are available at kategilbert.com. Thanks again, Kate! 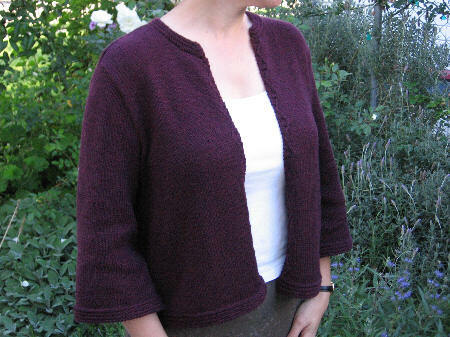 The Pearl Buck Swing Jacket is a wonderful design -- simple and classic. 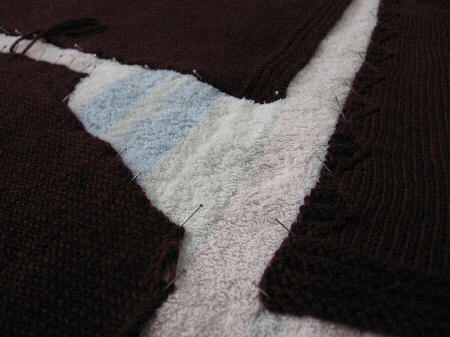 It comes together easily, and requires only a bit of care when blocking and piecing together to look very elegant. The Jaeger Extrafine Merino is beautifully soft on my skin. The elderberry color is lovely, too, full of depth and drama -- it looks rather more purple in some lights, but usually tends more towards the burgundy with purply-blue undertones. The pleat at the back is the most unusual thing about this jacket, but the half-diamond edging at the front and the back yoke worked from side to side are also subtle but interesting details. I made a minor adjustment to the length of the sleeves as follows: in the first decrease section (at the lower arm), instead of 11 plain rows between the decrease rows, I worked 13, giving a total of 14 rows for the shaping, worked 5 times altogether. At the "continue even" section just before the beginning of the cap shaping, I worked 12 rows straight, and the piece measured 11 1/4 in. instead of 10 1/4 in. as given. This kept the stitch count on the needle the same as in the instructions, but added about an inch to the length. I could just as easily have worked an extra inch straight at that last section before the start of the cap shaping, but this would have made the bell-shape end lower down, and I wanted to extend it closer to the elbow. (The bell-ness does not show much after blocking.) If I'd thought about it ahead of time, I might have added an extra inch to the length of the body, so that the sleeve/body proportions would have been the same as in the original -- as it is now, after I lengthened it, the sleeve is just a smidge shorter than the body, and would look a bit better if it was about two inches. This is a minor quibble, though! It is also very comfortable, partly from the lovely merino, but also the shaping and fit. Ten out of ten! Beth writes, "Another crazy busy week - I'm only just finishing up the second sleeve. Then on to the real business, I'm going to tackle the back." As for me, I finished knitting on Thursday night, and started sewing up on Friday! I actually have not had much experience in putting together a fitted garment -- in fact, I'm wondering if this is my first one -- have done drop-shoulders before, and the raglan-like sleeves of the top-down style, but nothing like these beautifully rounded ones. I was a bit apprehensive, and so I got out my old Vogue Knitting reference for reassurance. I found it much easier to sew in the sleeve cap before sewing up the sleeve and side seams, rather than sewing the sleeve and side seams first as the pattern says. I speak from experience, having done the first sleeve cap first (the way that VK recommends), and the second cap after the straight seams just now -- it was considerably less awkward doing that curved seam with the sleeve flat, so that I could hold the two pieces together more comfortably and smoothly. to snug with a single smooth pull on the working yarn. 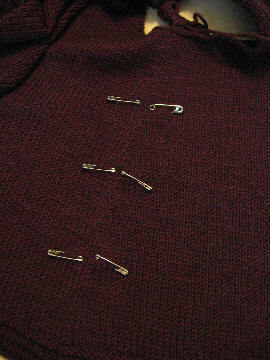 (It's almost like the way an invisible zipper pulls the two sides together.) I did have a lot of trouble with matching the lengths, and frequently ended up with about half an inch more on one side at the end of a seam -- on average, I think I did each seam three times -- and so I started putting in markers to match up as I went along, usually four on each long seam, so that any extra length would be distributed more evenly. I also used a safety-pin version of Vogue's and Knitty's marker method of picking up stitches along the curved neckline, dividing the length fairly evenly by 10 (for the 97 stitches -- a.k.a. almost-100 -- to be picked up). For those who, like me, are still fairly new to mattress stitch, I found myself dropping into this hypodermic position -- oddly enough, it was quite natural, even though I have never actually inserted a hypodermic needle. It felt much easier on my wrist than holding the needle in the usual manner, since I could aim and scoop up a stitch simply by moving my thumb, instead of my whole wrist. It wasn't always possible to do it like this, because of the way that some of the pieces fitted together, but it was helpful, and so I pass it along. I sewed in the twenty-seven ends -- would have been twenty-nine, but I knitted in two of them along with the collar -- last night while watching "Jericho" and "Rosemary & Thyme", two, er, rather disparate mystery series, the one grim and hard-boiled and the other a more typical English "cozy" mystery, light-hearted and not terribly demanding. Pictures, as they say, to follow! We have a new face in the knitalong this week, Bec of Glamorouse, who writes, "I'm feeling a bit of a fraud that I'm yet to cast on, but somebody has to be last, right? My last hurdle is that I'm still waiting on my Bendigo Wool Mills colour card to get yarn (Suse's recommendation and I trust her completely on this one!) but I have the needles, I have the pattern, and I'm returning to my normal job today after three months of an extra-demanding project so hopefully I now also have the TIME to knit!" As for me, well, I didn't think I had the time this week either, since my choir had not one but two performances of Mozart's Mass in c minor, involving numerous trips both "home" and "away" for rehearsals, and the concerts this weekend. This was more than a bit of bother, but on the other hand I had Mozart in my head all week, and that can't be bad. as I finished both of the sleeves this week, and everything is blocking. 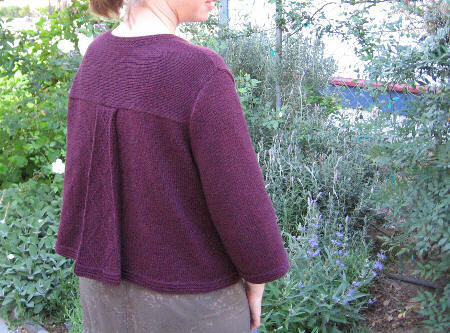 Beth says, "I've finished the yoke it's blocked and on gauge - hurray! Half way up the 1st sleeve and like you, wondering if I'm liking how big the cuff is. No pictures yet - I hope to post something this week. I've just had one of those weeks where everything hits at once." Fern says, "Not much to report from me although there's a gauge swatch in my near future. I took a class a few weeks ago about knitting to fit properly and part two is in two weeks. At this one we come in with gauge swatches for projects we plan to make and we'll get a little help in tweaking the pattern as necessary to fit us specifically. 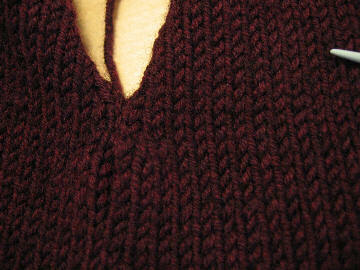 So I'll be knitting a gauge swatch for the swing jacket. Who knows, I may be casting on before month-end." Shelagh writes wearily, "This is remarkable, but true, my yarn is still backordered." this photo is from Two Swans Yarn. 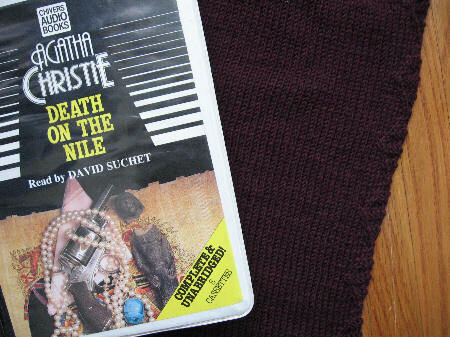 an excellent reading of the novel by "Poirot" himself, David Suchet. His own voice is quite unlike that which he adopts as Poirot (I once saw an interview in which he declined to come out of character, as it took him so long to get back into it), a rather calm, rich baritone instead of Poirot's soft, almost whispery tenor, and the voices he uses for the other characters, including the women, are equally varied and effortless -- except, I must say, that for Col. Race, Poirot's sidekick for this particular novel, who has I thought an extremely annoying upper-class-twit voice ("Bwing hew to the smoking woom immediately!") that only distracted from the easy brilliance of the others. I'd read this book before, many years ago, but am much more familiar with the delightful 1978 movie with Peter Ustinov as Poirot -- was rather disconcerted for a while at how much had been changed for the movie, but not terribly surprised, as I'm sure it's difficult to pack that much story into two hours -- the audio version runs to eight and a half! Many of the characters in the book were dropped entirely, such as Mrs. Allerton and her son Tim, and others, like Rosalie Otterbourne and Miss Bowers, were merged with lesser characters to streamline the story. I think that Suchet's Poirot is brilliant, though, and so I am equally happy with this audio version (except, as I've said, Col. Race, which to Suchet's credit didn't even sound like him!). But the swing jacket, that's what I was talking about. 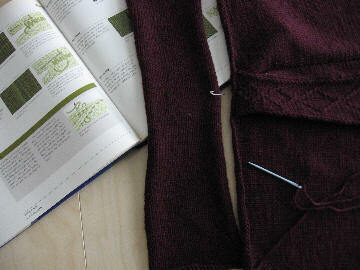 I worked the first sleeve yesterday -- yes, you read that right. I cast on for it Saturday night while David and I watched "National Treasure" -- I had to pull it out, though, as I was so busy watching Sean Bean -- excuse me, I mean paying attention to the complex storyline, that I accidentally picked up the long tail I'd left for sewing up the sleeve later, and began knitting with that, so I had to start again. Being stockinette, it goes very quickly, even with the cap shaping. I pinned everything together this morning for a fitting. The weather has been very grey these past few weeks, and so I wandered around the house rather gloomily, trailing long streamers of yarn like a madwoman. 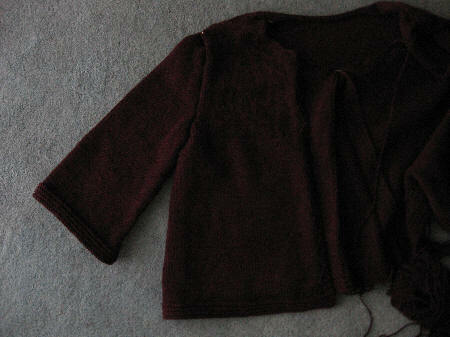 The gloom, I hasten to add, is due to the weather, not the swing jacket, which is coming along nicely. 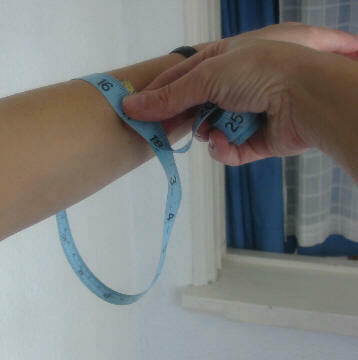 This is the sleeve width as written for the 44 in./112 cm size. The sizing I think is not terribly generous -- this is five inches of ease on me. The garment tends to hang open about 5 inches or so, just as in the IK photos, which means that most of the ease, as might be expected in a swing jacket, is towards the back. The shape of the sleeve is somewhat deceptive. 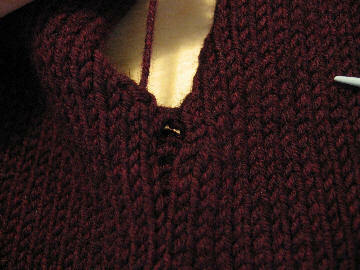 It looks fairly straight when laid flat, as below, but on an arm the weight of the knitted piece make the bell shape much more obvious, as you can see in the photo above. If the weather stays this dull, I might even get to wear the jacket before autumn! 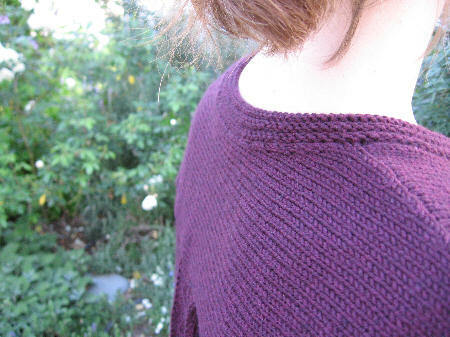 Beth has been having computer problems, so she hasn't blogged for a while, but has been using the time to swatch -- "I've finally gotten pretty close to gauge - I should probably be doing that needle switch off thing that you are doing to get it perfect, but I'm far too lazy and forgetful. I liked Suse's idea to start with the yoke since it's the smallest piece, so that's where I'm at right now. Hope to have some pictures soon!" Suse writes, "Nary a thing to show off. Son #3 requested a handknitted jumper as it's coming up for winter here. Why do the children's needs automatically come before the mother's? I don't know, all I know is that I have temporarily abandoned Pearl Buck (sadly) and have done the back and two sleeves of a 7 year old's jumper. In a very similar colour to my Pearl Buck, so at least we'll match when I finish both." Again with the social life chez Bluestocking! It's making my head spin. We had a cousin's wedding on Saturday -- Laura was the bridesmaid. 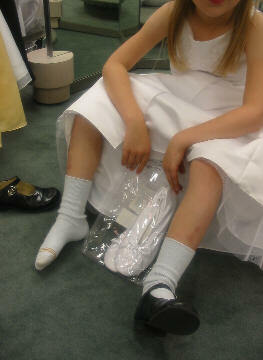 This photo, from when she was trying on dresses, is especially poignant for me, as the dress made me aware of how fast she is growing up, and the way she is sitting shows how much she is still six. So, well, I didn't get much knitting done this weekend! I have spent most of the weekend outside, catching up on what I like to call gardening, but is really weeding. The weather's been perfect -- rather cool, with sun off-and-on, nice for being outdoors. No knitting, though, but apparently I'm not the only one! Beth writes, "Public mortification - I'm still swatching. 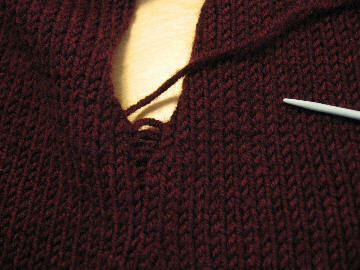 The first swatch was too large, of course I didn't have the next size down needles. Couldn't get to the yarn shop with all girls at home last week. So ashamed! I hope to have something more interesting next week." 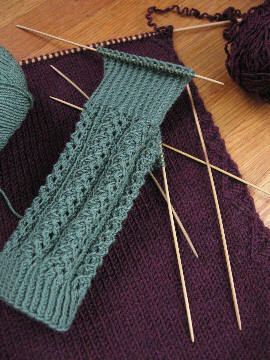 Suse has had a busy week, although not intentionally -- "I've finished a sleeve and am working away at the second. However a trip to the hospital with a certain young man has waylaid me a tad and I haven't picked it up for a few days now." Thought I should finish the second Hedera sock while it's fresh in my mind. I'm still avoiding making a decision about the Swing Jacket sleeves, though am fairly sure that I will resize them -- it's just a question of how much. Beth writes, "I've finally bought my yarn! It's Dalegarn Hauk in a pretty shade of olive. I really wanted to buy some gorgeous Jo Sharp DK in a color called glade, but it was twice the price, couldn't justify it. I'm swatching right now and pretty pleased with the yarn - I hope to post a picture (at least of my yarn and swatch) soon." 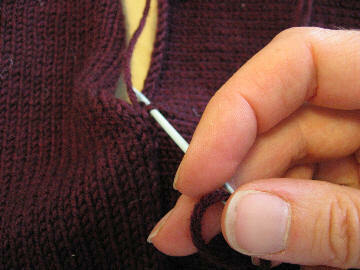 Suse writes, "I've finished the yoke, and am working my way steadily through the first sleeve. No pics this week; I'll try and do better next week."